Diary submitted by Laura B. This assignment aims to address the topic of B1 and B2 certificates and their importance in Spain. I will discuss this topic using my own experience as well as the knowledge and experience of others who have wrote about the subject. Learners are divided into six different levels of language capabilities; based on The Common European Framework (CEFR). Starting at A1; breakthrough or beginner to C2; Mastery or Proficiency. 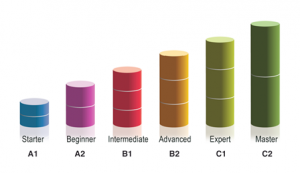 B1 (Threshold or Intermediate) and B2 (Vantage or upper intermediate) levels are the most important certificates to achieve for people in Spain. To obtain a B1 or B2 certificate, the learner has to show efficiency at this level across the four main concepts; reading, listening, speaking and writing (Weingarten, 2016). The number of Spanish adults taking English exams has seen a dramatic increase since the beginning of the economic crisis. “It’s an easy connection to make, they want it on their CV to improve their prospects.” (Jones, 2015). In a 2011 study carried out by Education First, Spain ranked as one of the worst European countries in English proficiency, with a score of 49.01. Only two countries within Europe; Russia and Turkey, dropped below Spain’s ‘low proficiency’ ranking. Since this study, Spain has now worked its way to the top level of ‘moderate proficiency’ European countries; now above France and Italy. “These days English is a must for any Spanish CV. Even if applicants are not applying abroad, many Spanish companies weathered the crisis by exporting.” (Blaus, E; director of Cambridge English for Spain and Portugal) (cited in; Jones, 2015). Since beginning my teaching with the school in Valencia, I always ask new students why they want to learn English and what they want to gain from acquiring the language. The reply always emphasises the importance of being able to speak English; not only for general communication but in terms of University choices, Erasmus opportunities and future job prospects; overall, a better quality of life. The expected CEFR level for most study programmes around the world is B1-B2, meaning if you are not at this level, unfortunately, you will not be able to study at any English-taught courses across the globe. Erasmus opportunities and University choices are an important factor in obtaining B1 and B2 certificates in Spain but one of the main reasons behind the importance of this particular level arises from the fear of young job seekers during the economic crisis. Official data shows that more than 1.85m Spaniards under the age of 34 are unemployed (Buck, 2016). An unsurprisingly large number of pupils that I teach are moving to the UK, London or Manchester in particular, or have plans to do so in the near future. It’s simple; if Spaniards want to improve their job prospects, they need a good level of English on their CV. Overall, it is clear that B1 and B2 certificates play a hugely important role in determining Spaniards future career paths and their quality of life in general. If they want to work out with Spain in the future or increase their choice of University options, then holding a B1 or B2 certificate is a must.